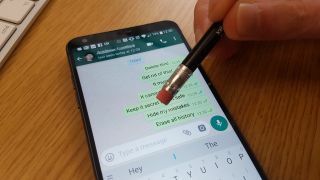 WhatsApp looks like it is in the final stages of testing its Delete For Everyone feature that will allow you to delete a message you’ve sent, hopefully before those little ticks turn blue. According to WABetaInfo, a Twitter account dedicated to all things WhatsApp beta, the recall server is now fully functioning and deleting messages. That doesn’t mean that the feature is live yet, just that it works. The applications of this feature are pretty obvious to anyone who has ever accidentally sent a message complaining about a colleague to that colleague, messaged an ex after one too many mojitos, or fallen victim to an unfortunate autocorrect. The feature will work on both Android and Apple devices, and will delete the message from notifications in both. That means if you get to it fast enough, the recipient may never know what you’ve said. It looks like they'll still get a notification, but it will read “This message was deleted” meaning you’ll probably still have to be a little imaginative if they ask what the message was about. As this is a leak we don’t have official information about where and when this feature will be rolling out, but we have contacted WhatsApp for comment and will let you know official information once we have it.